Are There any Industry Certifications for Business Professionals? Once you have your business degree in hand, it’s time to look into the industry certifications for business professionals. Obtaining certification usually requires that you become a member of a specific professional organization and that you take a test that asks you questions about your industry. Depending on the certification that you obtain, you might find that this simple piece of paper helps you find a higher paying job and stand out from others competing for those same positions. The American Society for Quality is the organization responsible for awarding the Six Sigma Black Belt Professional certification. According to ASQ, anyone can apply for certification after paying a $450 fee, but members can receive certification for just $309. You must show that you completed a Six Sigma project in the recent past and submit documentation that verifies that project. After applying for certification, you can take the Six Sigma test. Six Sigma is a system that relies on six key principles that can make you a stronger and more effective leader and manager. The Association of Proposal Management Professionals offers three different types of certifications for those working in bid and proposal organizations. Each level requires that applicants demonstrate proficiency in their chosen fields and that they have a certain level of experience. 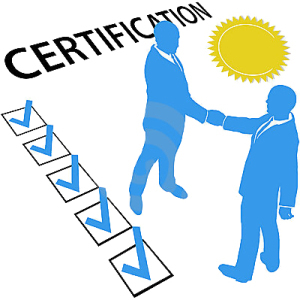 The basic level of certification shows that you are an accredited member of the organization, but you can also apply for two other levels of certification. Each level requires that you take an examination after submitting your credentials and showing your experience. Members of this organization must also agree to continue their studies and work on gaining additional degrees in the future. The Certification for Competency in Business Analysis is another of the industry certifications for business professionals. Designed for those who want to demonstrate that they have specific analytical skills and that they can lead and manage others, it requires competency in the form of successful passing of an in-depth examination. Business analysts may work for an organization, independently and on a freelance basis. They look at how a company operates and determines if the company can operate in a more effective way. These professionals may also determine current market trends and use research to predict the trends that will impact the business world in the future. A manager is one of the most important positions within a company. Many corporations and companies have multiple managers working for its facilities. They are the ones responsible for leading employees, setting up schedules and keeping the company running efficiently. Obtaining your Certified Management Consultant certification is one of the best ways to show that you have the skills needed to lead and manage those employees. As there are multiple organizations in the United States offering this type of certification, you need to look at the requirements for each one. You generally need several years of experience in a management position and a high score on a management examination. You can find industry certifications for business professionals through a number of different organizations. If you obtain even one professional certification, you might find that landing a job after leaving college is a little easier. This shows that you went the extra step to showcase your experience and skill set.